Despite the current volatile economic situation in Argentina, it is nevertheless an increasingly attractive country for foreign investment. A country with a highly educated population and the highest level of English proficiency in Latin America means setting up a company and hiring employees in Argentina is all the more appealing. With the vast and distinct geographical landscapes and the diverse range of natural resources, the trading opportunities for foreign investors in this Latin American country are endless. 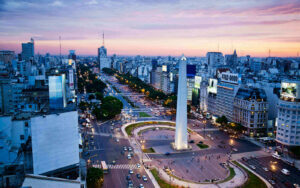 There are numerous trade benefits for companies looking to do business in Argentina. Being a full member of the MERCOSUR bloc – Argentina, Brazil, Paraguay, and Uruguay (Venezuela is temporarily suspended) – Argentina proves to be an even more attractive country for trading opportunities in its fast-growing markets. Negotiations are currently underway for an EU-MERCOSUR agreement which has the potential to open up many doors to yet more trading opportunities. Argentina is also one of the founding members of the Association for Latin American Integration (Asociación Latinoamericana de Integración, ALADI) which intends to create a Latin American Common Market. Furthermore, Argentina has favorable legislation aimed at attracting entrepreneurs and foreign investment. It is home to several Free Trade Zones (FTZs) and also a few Special Customs Areas (SCAs). The principal FTZs are in La Plata, Tierra de Fuego, and General Pico La Pampa. Businesses looking to Incorporate a company in Latin America should investigate trading opportunities in these areas to take advantage of the tax benefits. Entrepreneurship is also actively encouraged by the government, with the passing of the recent Entrepreneurs’ Law (Ley de Emprendedores). There are no restrictions on foreign investment in any industrial sectors and there is also no restriction on the percentage of foreign ownership in a local entity. The climatic diversity in Argentina provides many trading opportunities for foreign investors. Argentina has vital natural resources and regions with the perfect climate that need to be exploited both from an environmental and an investors point of view. The government is actively seeking foreign investment, giving investors in the renewable energy sector several benefits including early recovery of VAT, accelerated depreciation and relief from import duties. The financial and environmental benefits of wind and solar energy are already being reaped, but there is still plenty of potential and capacity in these two energy resources but also in biomass, biogas, and biofuel. The 2015 law on Renewable Energy (Law Number 27,191, Article 5), details that by 2025, 20% of the national electric energy consumption should be from renewable energy sources. This is, therefore, a sector that needs more investment because of the planned rapid expansion set in place. The IFC and World Bank kick-started the investment in this sector in Argentina and have helped to create a new market for investment. As a reassurance to private investors and a way to reduce financial risks, the World Bank has created a $480 million guarantee supporting the Renewable Energy Fund (FODER) enacted by the government. The perfect conditions have been created to encourage investment and trade in this important sector. By 2025, 20% of Argentina’s energy consumption is planned to be from renewable energy resources. Argentina’s agroindustry still has great potential for trading agricultural goods and products worldwide. It is in the top ten for countries with arable land – having over 30 million arable hectares. The incredibly fertile land has been a huge factor in Argentina’s success in soybean production. It is globally renowned for being a top exporter of soybean flour and oil, accounting for roughly 18% of the global production of soybeans. What has enabled the development of soybean production but also food production in general, is the advancements in technology that have helped with innovations in agricultural machinery and food processing. There are some key benefits that are aimed at encouraging foreign investment and trade in the Agricultural sector. These include a reduction of the tax burden and the modernization of transportation and infrastructure. Within the agroindustry, there are several subsectors that have the potential for growth and therefore increase the likelihood of successful investments. Whether it be the production of wine, meat, wheat or wool, the climatic diversity in Argentina provides investors with fruitful trade opportunities. The country is home to one of the largest shale gas reserves in the world and a vast shale oil reserve. Argentina has huge potential for the continued development and exportation of hydrocarbons. In particular, the investment opportunities in the Vaca Muerta reservoir, located in the region of Neuquen, has a wealth of opportunities that can be taken advantage of by foreign investors. The resources in Vaca Muerta are estimated to be a total of 16 billion barrels of oil and 308 trillion cubic feet of gas. It is evident that the Oil and Gas sector in Argentina is very lucrative indeed. Whilst the renewable energy sector is rapidly expanding, this is not to say that the demand for oil and gas will diminish any time soon. According to the Argentine Investment and Trade Promotion Agency (Agencia Argentina de Inversiones y Comercio Internacional), “the country has 24 continental and oceanic basins, out of which 5 are being exploited.” Oil companies such as Total and YPF have already invested large sums of money into this rapidly expanding sector. The outlook is hugely promising and should definitely be exploited at this relatively early stage whilst there are still plenty of trading opportunities available. The government has a strong interest in supporting investments in this sector, with plans to reduce import tariffs to 7% on machinery needed for exploiting hydrocarbons. Furthermore, there is a new Gas Plan that seeks to encourage investments in the Neuquen basin reservoirs, ensuring that there is a minimum price guarantee in the local market. The Ministry of Transport is also rapidly addressing some of the infrastructure problems in this region to facilitate a better and easier exploitation of the oil and gas reserves. With the continued drive to improve infrastructure, the potential trading opportunities in this sector will greatly increase. Argentina is undoubtedly an attractive jurisdiction to do business in, with a diverse natural resources base and many trading benefits. If you are want to learn more about why and how to register a business/company in Argentina or need tailored advice then our team at Biz Latin Hub can help you. Do not hesitate to contact our bilingual Country Manager, Javier Alegre at [email protected] to see how we can support your business venture in Argentina.